Hosts Janet Kira Lessin & Dr. Sasha Lessin interviewed Michael Lee Hill on Monday, July 21, 2014 on Extraterrestrial Radio on Aquarian Radio on www.blogtalkradio.com/aquarianradio. On this show–which you hear when you click the Blue arrow [not the white one] on the second icon below– we talk about the work of AR Bordon and his experiences with The Linkage Institute. 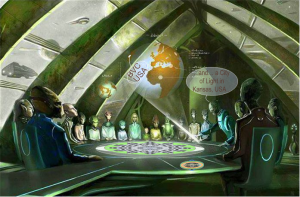 Members of this exopolitical network have backgrounds with corporations, military and intelligence agencies, but the group works independently and negotiates as a loosely knit operation to identify and to understand the evolution, motives and agendas of a rather large number of extraterrestrial races and civilizations and their interactions with earth humankind. The big picture is of a well-populated universe of space faring beings of very diverse nature, some who have taken an interest in Earth affairs for a number of reasons as it is profitable for them to interface with us out of self-interest and cooperative interest. Michael Lee Hill and Dr. AR Bordon Talk – The Anunnaki Papers – Setting The Record Straight! See many of Dr AR Bordon documents at http://www.scribd.com/mhill_300992. Any serious citizen of this planet should study Bordon’s documents on the hotlink. Below, we share one of Bordon’s papers. On the show, Janet reads the letter (excerpted below) from AR Bordon gave to Michael Hill to share with the world. Bordon read this letter aloud to the Annual Confederation Council of ETs concerned with Earth. I come to you today with a petition in hand. The petition is for Observer Membership at this LinkTable for the Linkage Institute International an initiative of the Life Physics Group California. There are three members of the Life Physics Group here today Robert, James, and I. By our initiative, people on Earth are beginning to gather in a group now named the Linkage Institute, using the term linkage as a byword of the process we here and now continue to undergo between all of us, each from different world, every year now for nearly twenty years. Today, now, think of the start of this initiative as a small grain of sand in the vast six billion and more specks of human lives now inhabiting the Earth. With every year, the numbers of members of this Linkage Institute will grow, as words gets out that there is a way to make one’s voice count in our dialogue with all of you. In doing so, we will also uphold and respect the sanctity of Life, sanctity in the meaning of its completeness and wholeness. As a Linkage Institute, we shall uphold Life by seeking and actively pursuing membership of the Institute to be a 3-percent of the growing total of the population of Earth. We do so to achieve the indexing of the whole of humankind to a system of resonant harmonic unity that is the stage of evolvement necessary for all life forms now at the stage we find ourselves in, in accordance to the physics of life which you have taught us. We seek this indexing of the whole by its 3-percent so we may become a One-Org, which is the present centerpiece and imperative of humankind on Earth a mandate to the people of Earth who may then speak with one will and one mind before the people of the universe Unum. By this, we recognize Life as It Is. Robert, James and I as Members of the Link and as founding members of the Linkage Institute come before you to ask you to consider this petition. Humankind comes before you, knocking at your door to be let in to sit at your table. Humans are yet not a unison in voice and will. We argue here that it will, given more time, and that Life on Earth in human form shall prevail and overcome all vicissitudes and barriers to its harmonic resonance with itself and all life in the universe Unum, for it is written in all of our sacred books and already inscribed in each human heart and mind on all peoples of Earth. Mind our words here and remember them for, as prophecy, we shall fulfill it as spoken here. What is humankind who comes before you today? Let me speak on our behalf. We humankind of Earth are a biological kind, much like most of us present here now. We are not client of anyone, nor do we seek clientage from anyone present here or present in the space of the star system to which the planet we are now on belongs. We, members of the Linkage Institute of Earth, seek to come to you as observers to learn and to respectfully be heard. As you already know, we yet do not carry the voice of three percent of our human biokind, but we aim to carry this voice in the future. It is our solemn pledge that we shall, one day, speak as the three percent for the plenum majority of humans not aligned to or belonging in official organizations. We, as Linkage Institute, also do not belong to and do not participate in corporate entities for funding or sustenance, nor do we have any kind of direct or indirect relationship with the International Monetary Fund and the World Bank. The Linkage Institute is also not a part of, beholdento, or in any way, directly or indirectly, associated with the United Nations. We wish only to sup up to the table as rightful member of an assembly of life not native to the Earth, which now exist on Earth space and now exerts influence on the affairs of the people, governments, and nongovernmental organizations of Earth. What we are: we are a biokind. We are Life. It matters little to us whether a God of our mentation created us, whether those who from heaven to Earth came purposefully panspermed us as new information on our planet now lets us know, or whether we are the product of an evolvement from RNA-DNA which somehow (now matters not how) reached the surface of the Earth we know, inhabit, and own. The fact of the matter is: We Are! If we claim history as to how we got here, we were once squatters in what now is ours. This is no longer a matter for debate, and a fact you must come to recognize because it is a fact you must also come to grips with. We are undeniable. You may deny us Observer Membership on this body, and you can deny us longevity and even life. Should you deny us membership now, somehow, somewhere else, somewhen, we will come up and come out again as living biokind, life forms sentient and aware and undeniably connected to each other and a creative force that course through us as it courses through each of you. We may even do so on this planet once again, as we have done so several times before. The creative force that course through us as it courses through each of you we know and call it God, indivisible and En Pluribus Unum, one in many, for we believe It contains us all as it also contains each of you, whether or not you believe it so. We now know that wisdom without longevity is illogical to our evolvement and progress as a singular biokind, and we are redressing the error made by our progenitors, those whom we know came to Earth to mine its riches and who are our ancestral roots, the founders of our biokind. We know and remember in our cells and in the marrow of our bones their act of creation. We also know and understand the circumstances engendered amongst themselves by their perceived needs. We remember that, too, and while we forgive it now, we also remember it and will not forget. And so we moved onward, to a future only we can craft for ourselves. Michael Hill, who brings us Bordon’s work, is a musician, filmographer and UFO experiencer. His footage of the Lake Eri e UFO’s has created a Billy Meier like buzz and this unassuming rocker seems to have developed an intuitive relationship with these craft. In his home state of Ohio, Michael has been cataloging video after video of UFO’s over Lake Erie. What makes these different than most sightings is that the phenomena consists almost entirely of ‘Pulsating orb’s of light’ characteristics. Unusual lights seen changing colors, converging, and separating over the lake. Stories of the unexplained phenomena date back over 150 years to the indigenous tribes. Michael’s Lake Erie UFO footage has been featured on Fox News, Coast to Coast AM, Rense.com, hbccufo.org and in the feature film’s “UFO’s unplugged with Dan Aykroyd”, And David Sereda’s latest film From Here To Andromeda which Michael also co-produced. Michael was also featured on the History Channel’s “UFO’s Hunters” show. Bill Birnes * (UFO Hunters – History Channel – NY Times Best Selling Author) Revealed Lake Erie Contactee Michael Lee Hill may just be a Human/ET “Hybrid”! On the UFO Hunters “Alien Contact” episode, the UFO Hunters decide to test Michael Lee Hill’s blood and it is revealed Michael has a “Unknown” very rare blood anomaly/bloodline that the worlds best military and civilian doctors are at a loss to explain. A Harvard doctor uncovered non-normal human elevated levels of Creatine Kinase in Michael’s Blood stream. 102 minutes. “UFO SECRET: FROM HERE TO ANDROMEDA” opens with the possibility that humanity may not survive due to Global Warming, an ensuing Ice Age or Mass Extinction. The question is, “Why hasn’t humanity embraced sustainable technologies like Solar, Wind, and Helium-3 Fusion to beat Global Warming?” Why are the oil companies holding us hostage? Why hasn’t all of humanity awakened and taken measures to ensure our survival? Find out why so many UFOs are suddenly appearing all over the world. Are they here to teach us? Are they here to help humanity make a quantum leap? What do Governments know about UFOs? Will humanity find a new home in the universe? Join UFO Researcher and Environmentalist David Sereda as he embarks on a journey in search of a way to travel to the Andromeda Galaxy 2.2 million light years away to find a new home for humanity. Along his journey he explores Sustainability, UFOs, Crop Circles, Space Propulsion Theory, Spirituality, and Human Ethics in order to solve the greatest riddle in the universe: How can one travel faster than the speed of light and go anywhere in the universe in the blink of an eye. Features: Lockheed Martin Senior Research Engineer – Boyd Bushman, and Professor of Indo-Tibetan Buddhist Studies at Columbia University – Robert Thurman, and many more. It does not take many of us vibrating at a higher more love filled vibration/frequency to effect the entire Mass Consciousness, only 3% in fact. Amazing huh? The entire human race has to be vibrating at certain frequencies as a mass consciousness to TUNE into various Realities, from the most FEAR based thought-forms to the Most LOVE filled realities out of the numberless parallel universes and timelines and everything in between. …The first phenomenon is what we’ve come to call the 3 percent protocol. (By the way, this is something no one wants us to know or connect the dots about!) This is the recognition that when 3 percent of the population of a given life form (monkeys, fireflies, rats, dogs, cats) acquires and manifests a new behavior, the remainder acquires and expresses same as if by magic, regardless of distance or generational lineage. The second phenomenon, an external one to us yet actually an entraining one of us all, is the existence of seven centres of resonant harmonic entrainment located in all continents. We know now the location of four of them, and working at locating the remainder. We have a fairly clear notion of how they work, and what our part is, in the process that entrains us human beings. Much of this was already known to us in the early 90s, several years before Jamisson Neruda let the cat out of the bag to a journalist named Sara. Moreover, as a linguist, Neruda’s direct contributions to the present effort have not extended beyond his initial exposition of the matter in his interviews with Sara and through the website subsequently set up to publicize the findings. We have controlled experimental, and field quasi-experimental evidence that the 3 percent protocol leads to very interesting physical manifestations, material and phenomenological simultaneously. For instance, in the 01-02 winter in the Chicago area, an experimental protocol used by a group of shamans instructed on how to intervene upon weather systems led to the absence of snow in Chicagoland from the early part of November 01 through the middle of February 02 — well within the period of applications of these protocols by the group. The result was no snow whatsoever in the area – the object and intent of the applications. Another example was the presence of 3 percent effects upon the manifestation of another phenomenon by children, ages 8 to 11, in an experimental set up conducted in 03 by colleagues of mine using a protocol I had developed in 02. The result was that when 3 of the 10 participating children produced the targeted effect desired, the remainder began and did produce the same targeted effects within days. This experiment was conducted by two members of my group, and proprietary video evidence exists of the targeted effects being performed by the children. I won’t go into what the targeted effects were; suffice it to say that it definitely fell within what the Chinese refer to as extended human functions, and in fact it was a replication of an experiment done in China in the mid-90s. How do these phenomena help us as a biokind? Well, to understand how, we must place it within the overarching notion of a HumanOrg – that is to say, the sum total of biominds on the planet. Three percent of it would place the numbers at approximately 193 million souls. To get to this, we are presently quietly working with organizations on the net from all over the world to see if a field experiment specifically focusing protocol effects on something measurable can be seriously considered, carried out and studied. These, my fellow human beings, are but a few of the things I’ve dedicated my retirement life to. What this knowledge is revealing is that it does not take many of us vibrating at a higher more love filled vibration/frequency to effect the entire Mass Consciousness, only 3% in fact. Amazing huh? Clik this hotlink and learn who attends these annual meetings and what they discuss.